It turns out that the Blue Ridge Mountains’ name is quite literal. The mountain range appears as a cerulean landscape in the background along your drive. Photo courtesy of the Fannin County Chamber of Commerce. Road trips are programmed into our blood. Since the first pioneers took off to the West in search of treasure, health or a better life, the romance surrounding long-distance travel has rooted itself in American culture. ETA: About five hours from Atlanta. What you’ll encounter on the way: Tons of diverse greenery, as well as hills and valleys that make for nice photo opportunities. This swampland near the Florida/Georgia border is a wildlife refuge filled with prehistoric and rare wildlife. Once you arrive at the park, you’ve got the option of taking tours via railroad or boat, or participating in the Eye On Nature event where guests can get up close and personal with alligators, snakes and other wildlife, according to the venue’s website. The park offers options for the whole family, and presents a multitude of educational opportunities. What you’ll encounter on the way: Numerous scenic views, including places to stop along the highway, stretch your legs and take pictures. When there’s not a place to eat, there’s a plenitude of gorgeous scenery. This scenic town in the north of Georgia is nestled into a sprawling mountain range with lush forestry all abound. Whether you’re headed up to check out downtown Blue Ridge’s eclectic collection of small businesses or renting a cabin for the weekend, there is plenty to do once you make it to Blue Ridge. The Savannah Historic District is filled with architecture and sights of old. Image courtesy of the Savannah, Georgia Chamber of Commerce. ETA: About four hours from Atlanta. 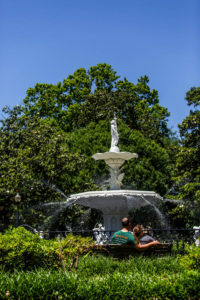 What you’ll encounter on the way: You’ll pass through Macon, which has its own gardens, parks and a river you’ll drive alongside of for some of the trip. The “Haunted Montrose” haunted house is a little farther along the journey, and once you arrive in Savannah you’re close to a number of coastal locations, including Tybee Island. This cemetery, made famous by the book and movie “Midnight in the Garden of Good and Evil,” is a beautiful (albeit grim) look into Savannah’s past. The southern-gothic styled architecture and Spanish moss create a deep, solemn atmosphere in an area absolutely filled with the final resting places of many notable historic figures. While the famous “Bird Girl” statue is no longer present at the cemetery, it is nearby in the Jepson Center for the Arts. Savannah itself is alive with beauty and history. In fact, the bench Forrest Gump sat telling his story sat right on Chippewa Square in Savannah. It too lives in a nearby museum. Hikers on Brasstown Bald will see views unparalleled in the state of Georgia, as this mountain is the highest in the state. 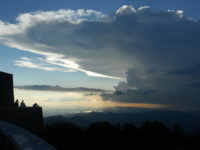 Image courtesy of the Brasstown Bald Visitor Center. ETA: About two and a half hours from Atlanta. What you’ll encounter on the way: Early in your drive you’ll encounter Lake Lanier, which is a great place for a short camping trip, swim or boating adventure. Offshoots from the lake will follow you for a duration of your drive. 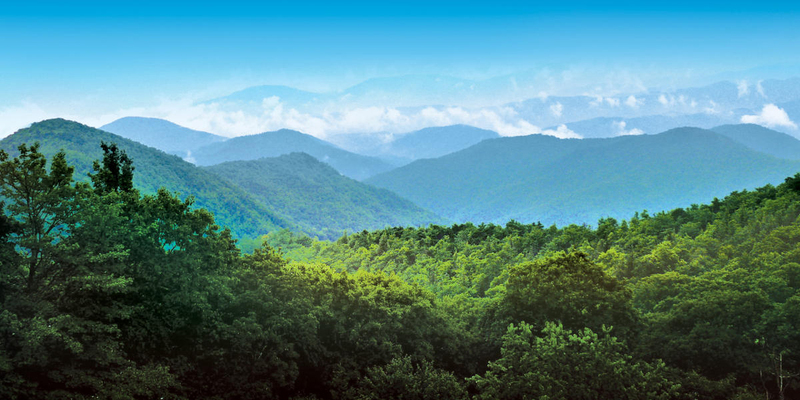 As you approach Brasstown Bald, you’ll be met with stunning views and plenty of greenery to photograph. Roads leading up the mountain range are great for driving, as they wind and wrap through the range. There are campgrounds where you can stop and take in the sights. Brasstown Bald is the highest natural point in Georgia, standing 4,784 feet above sea level, according to the Official Georgia Tourism and Travel Site. The mountain itself offers beautiful views and a great hiking location. Those of us who want to stay closer to sea level, however, can enjoy events, concerts and more at the nearby Georgia Mountain Fairgrounds. If you’re curious about the view, here’s a livestream from the peak of Brasstown Bald. The Jimmy Carter National Historic Site contains pieces of Jimmy Carter’s history, such as his boyhood home, Plains High School and the Plains Depot where Carter ran his 1976 presidential campaign. Image courtesy of the Jimmy Carter National Historic Site. ETA: About three hours from Atlanta. What you’ll encounter on the way: Plenty of greenery can be seen as you pass through the cities of Newnan, LaGrange and Columbus, Georgia. Once you make it to Plains, you’ll be met with a picture of yesteryear, as this historic city has showcased many of its older buildings. The town is a picturesque look at life from America’s recent history. The Jimmy Carter National Historic Site is a protected area which conserves and offers tours of locations significant to the life and history of Jimmy Carter, the 39th president of the United States. Guests can tour areas in the park such as the “Boyhood Farm,” the “Depot,” and the high school where Jimmy and Rosalynn Carter graduated.